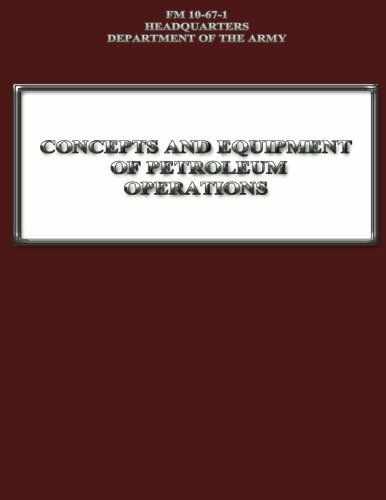 This manual, “Concepts and Equipment of Petroleum Operations (FM 10-67-1),” is a guide for commanders, staff officers, supervisors, and other personnel concerned with petroleum concepts, equipment, and operations. It is a consolidation of FMs 10-18, 10-20, 10-68, 10-69, 10-70, and 10-71 and is divided into four parts. Part One describes general considerations of petroleum operations to include environmental protection, safety, and accountability. Part Two describes bulk petroleum distribution systems. Part Three describes Army aircraft refueling operations. Part Four describes petroleum handling equipment as well as Class III supply point operations. This manual is oriented toward tactical field operations and deals with the responsibilities of both management and operator personnel.